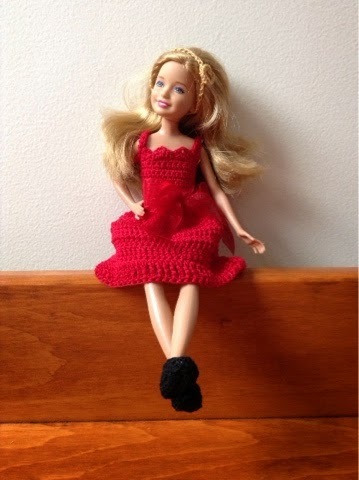 I have searched the internet for crochet outfit patterns for Stacie Barbie dolls, but I didn't find any patterns for her. So, I decided to make some patterns for Stacie and post them here. This one is the first and is probably my most favorite design ever. 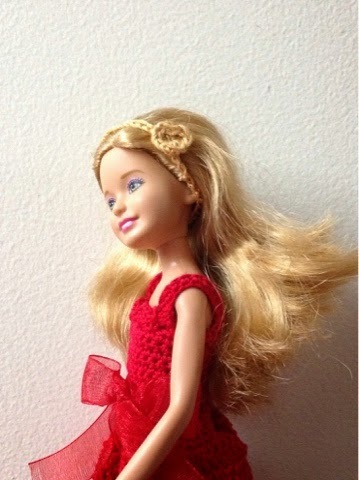 When I saw the new Annie movie, I was inspired to make Annie's famous Red Dress for Stacie. I made sure to make the back part of the skirt longer than the front part, and I even designed shoes and a headband to go with it! 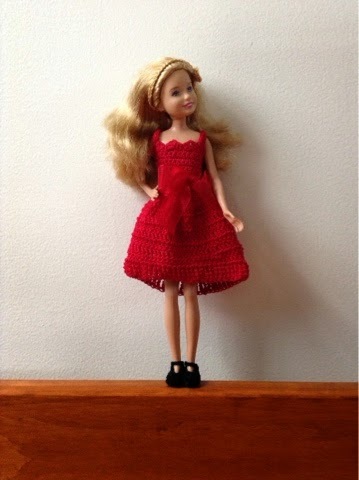 So, here is a crochet pattern for Annie's Red Dress that is specially fitted to Stacie. Enjoy! Row 2-12: Ch 1, 1 dc in each st across, turn. Row 13: Ch 1, (sc, sk 1 st, shell in next st, sk next st) 2 times, sc in next st, ch 10, sl st in ch-2 space of 1st shell, turn, ch 2, 1 hdc in each ch across, (now back to normal row) sk 1 st, shell in next st, sk 1 st, sc in next st. Fasten off. Turn piece and repeat this row, starting on opposite end. Row 2: Ch 1, 1 sc in each st across, turn. Rnds 3-9: Ch 3, 1 dc in each st around, join to first st, turn. Rnd 10: Ch 5, 1 dtr in each of next 6 sts, 1 tr in each of next 6 sts, 1 dc in each of next 6 sts, 1 hdc in each of next 6 sts, 1 sc in each of next 12 sts, 1 hdc in each of next 6 sts, 1 dc in each of next 6 sts, 1 tr in each of next 6 sts, 1 dtr in each of last 6 sts, join, turn. Rnd 11: Repeat rnd 10. Rnd 12: Ch 5, 1 dtr in each st around, join, turn. Sew ends of ribbon onto edges of dress. Tie in a bow. Rnd 1: Ch 2, sc in 2nd ch from hook, 1hdc, 1 dc, 1 tr, 1 sc, 1 tr, 1 dc, 1 hdc, and 2 sc in same ch. Join to 1st st. Sl st to back center of heart, ch 37, sl st in center of heart. Fasten off. Weave in ends. Rnd 1: With Black, ch 8, sc in 2nd ch from hook, 1 sc in each st across, 3 sc in last st, turn 180 degrees, 1 sc in each ch loop, 3 sc in last st, join to 1st st.
Rnd 2: IN BACK LOOPS ONLY, ch 1, 1 sc in each st around, join. Rnd 3: Ch 1, 1 sc in each st around, join. Rnd 4: Ch 1, sc dec over next 2 sts, 1 sc in each of next 5 sts, ch 9, sc in next st, 1 sc in each of next 6 sts, (sc dec) 3 times, join. Gather front of shoe slightly. Weave in all ends. You are very welcome! I will be posting more patterns for Stacie and maybe even some for Chelsea. What size is a Stacie doll? A Stacie doll is nine inches tall. She is between the height of the Skipper doll and the Chelsea doll.